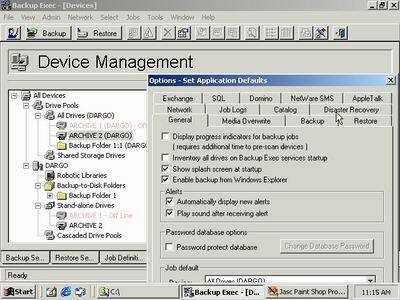 The latest in backup software handles the complexity of Windows 2000. Veritas Backup Exec comes in five editions, ranging from Datacenter Edition with full robotic library support, to a Small Business Server Edition and even a non-server QuickStart Edition. Whichever edition you choose, you’ll probably want to purchase additional agents and options. The software is compatible with NT 4.0, Service Pack 4 or better, and all Win2K versions. In addition to its own tapes, Backup Exec can read tapes from some versions of ARCserve. Backup Exec has dedicated agents available to handle data from MS SQL Server, MS Exchange Server, Lotus Domino, Oracle Server, R/3 Agent for Oracle, SharePoint Portal Server and more. Advanced options include open file backup, network storage executive (to manage larger installations of Backup Exec centrally), SAN shared storage support, Intelligent Image (which backs up file metadata separately from the file data), intelligent disaster recovery, and library expansion (for multiple robotic drives) as well as antivirus software. This release also includes the ability to use a dedicated LAN for backup, reducing network traffic, and the ability to backup to disk. Win2K-specific backup choices include AD, COM+ class registration database, registry, SYSVOL and system files. I tested backup and restore of AD information, a registry hive and a junction point successfully. Backup Exec’s open file option won’t back up encrypted files, and the entire system state is restored as a single entity (registry, COM+ database, boot and system files). The restore wizard lacks some control over options such as relocating restored files. This is only available in the Restore Job properties dialog box. For specific Win2K properties, the default under Junction Points is to restore these points from backup media, not to preserve the ones existing on the to-be-restored device. A mount point (a directory reference on one volume mapped to another volume) can be restored, but the backup will fail if the junction point recursively includes itself. Other specific Win2K information that can be restored includes disk quotas, Terminal Services database and cluster quorums. With Backup Exec, my typical backup job averaged 10-plus MB/minute on an older DDS tape unit, and the counters appeared accurate in the job monitor. 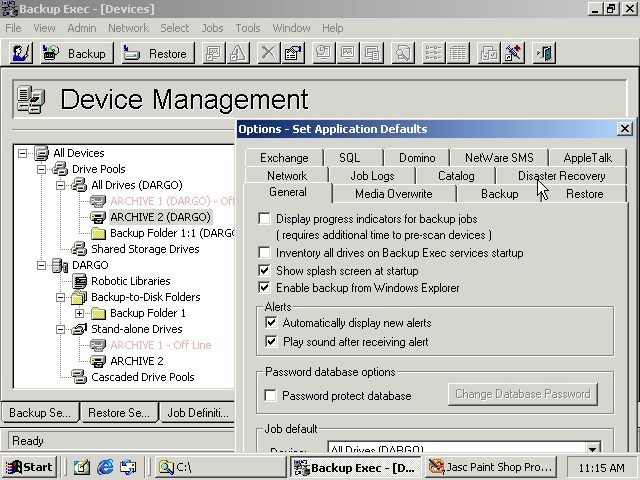 Quibbles aside, Backup Exec has some useful advanced options, such as cluster support, and good integration of NetWare and Windows backups.